I could see why this one had been flagged by other RV’ers as a great overnight location. I’d never seen a highway rest area as large as the one where we spent our first night of “year 2” on the road. This bizarre, outdoor, concrete motel had 3 separate parking areas, each progressively further from interstate noise. The first was for people making a quick stop for bathrooms, vending machines, maps, dog walking. The second was a larger, quieter lot with a large bathroom where cars and vans could park and sleep for the night. The third was where we spent the night, in a long row of pull thru parking spots nestled between other RVs and idling semis. It was a fantastic place to sleep for free one night to break up the distance between Wenatchee and our Oregon coast destination. The only catch was that as we prepared to leave the next morning, our slide wouldn’t come in all the way. It came about 75% of the way and then came to a halt. It wouldn’t budge either direction, and no pushing or pulling seemed to make a difference. Brad ended up with his tools, under the rig on the chilly morning, looking for the crank to bring it in manually. 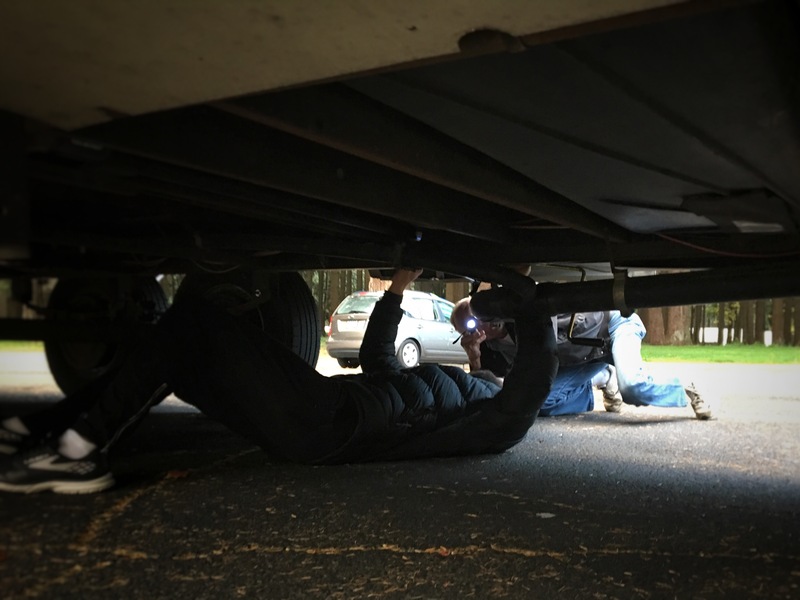 In the process of crawling around under our rig, Brad drew the attention of the man towing the RV next to us. “Having some troubles?” he asked in a calming tone as he approached. He knelt down with a flashlight and joined the adventure of finding the right mechanics. Once located, none of Brad’s wrenches fit, but to our delight we had purchased the wrong size for a water heater clean-out that was waiting to be returned to Home Depot…and it was the part we needed!! It took quite awhile, but Brad was able to slowly bring the slide in manually, one crank at a time, as our friendly neighbor held a light and chatted with us. He told us that for a living he tows RVs between dealerships, and spends many nights sleeping at rest stops like this one. But since the trailers aren’t his, he doesn’t even get keys to them, so he sleeps in the backseat of his dodge truck which has 752,000 miles on its odometer. I’ve heard that Diesel engines can go forever, but we asked him to repeat this number 3 times to be sure that we heard him correctly. He told us about how he had just turned 70 on the worst possible birthday, September 11, but I told him not to be ashamed because it was his day first. He told us about his wife and their years of living in an RV, but she grew tired of the arrangement because there wasn’t enough closet space for her shoes. He brought an air of peaceful cheer to the unexpected chore at hand, and before we knew it we were ready to be on our way. Another friendly face, this one sleeping in his truck next to us on I-5…helping us keep our sanity in a potentially stressful moment. He made our day, and we didn’t even catch his name.